I got one of these phones when they first came out – they were pretty awesome back then, however over time they have been orphaned on older, vulnerable iterations of Android and they simply don’t have what it takes to be a primary device any longer. Because of this – I’m currently looking to root the phone and install upon it a modified ROM which will give me *just* what I need to turn this into a useful device for sitting in the car. Step #1 – Hard Reset to Factory Defaults. Keep holding the buttons until ‘Clear User Data’ is displayed in text on the phone’s screen. The phone will continue to boot after factory resetting the device (note, items on the Micro SD card will NOT be affected – you would need to reformat that independently yourself. Step #2 – Find a ROM. What we can do as an industry is limited by the overall reluctance for users to double check what they are doing, coupled with the difficult situation created when differentiating device/product or service in a low-margin, rapidly evolving market. This quote sets the stage for the overwhelming influx of technologies into our lives and especially the lives of our children. The problem is, parents are being fed these lines time and again to the point where many throw in the towel and give up trying to stay current with what their children are doing. Hat tip to @VodaphoneNZ for re-igniting my interest in having another crack at the following post which I originally wrote for an internal publication for my employer. I’ve changed some of the phraseology,but the basic content – apart from the opening paragraph – remains pretty similar. Once again, these are my personal opinions and are presented as such. If you are in any way connected to the mobile phone world, you would have heard of the Android phones, an increasing number of which are now starting to make their way into the New Zealand market. Vodafone have been quietly selling android phones since the middle of last year, and third party importers have been importing them in increasing numbers since around the same time. 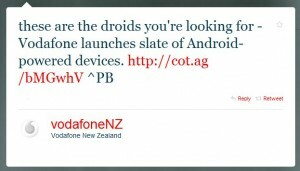 With the release today of ‘FroYo’ (Android 2.2), Vodafone NZ have come out with an impressive looking list of devices sporting the Android stack. â€˜Androidâ€™ is a software stack including an operating system, middleware and core applications â€“ kind of like Windows on your PC. It was first unveiled in 2007 by a firm who was subsequently bought by Google, whoâ€™ve since released most of the code under the Apache (software and open source) license. And that decision is what has captured the attention of the community.